The Care Quality Commission (CQC) is an organisation set up to check whether hospitals, care homes and care services are meeting national standards of quality and safety. Since 1 April 2013, GP Practices have been required to register with the CQC. 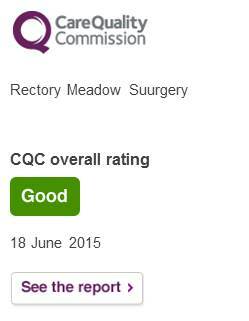 Rectory Meadow Surgery is now registered with the CQC. Click on the links below for a copy of our Statement of Purpose. We are please to receive a rating of GOOD for our services.